How did this patient hear about Cortlandt Healthcare? Thomas T. knew about Cortlandt Healthcare because he was here before in 2013. During Thomas Tinsley’s stay at Cortlandt Healthcare, he was very determined to regain his strength and eventually be discharged home. Thomas began therapy with a right and left knee brace and some chest pain. His baseline in therapy was fair and used one assist, but had some difficulty shifting his weight. In the beginning, he was only able to walk a total of five feet and was not able to use the stairs. 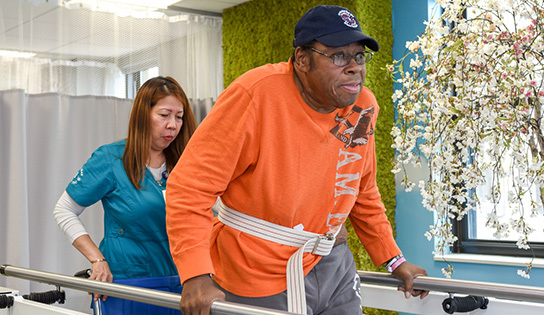 After receiving physical therapy for six days a week for a few weeks, Thomas was able to gain momentum and strength in his legs. He went from walking five feet, to 100 feet, in just four weeks. He was then he was able to walk 150 feet by November 20th! Once Thomas was able to get up and walking, the next goal was the stairs. Thomas had set a goal to get over a handful of stairs in order to have a safe discharge home. During his eighth week here, Thomas was able to walk up and down a total of 16 stairs! Lastly, Thomas completed his goal of a car transfer, safely and independently, the same week. Thomas describes his physical therapy experience as, “they are excellent and always on top of my exercises, and they are fantastic; such professionals!” Overall Thomas T. rated his experience a 10 out of 10 for satisfaction! We are proud that we can provide the care for those in need. Thomas was a great resident who set a wonderful example to those who require rehabilitation!